Best Performance Awards (mai) : for listed companies with outstanding best performance, based on Good Corporate Government, SET’s Rules , Disclosure of Information and quality of Financial Statement . Best Investor Relation Excellence Awards (mai) : for listed companies with outstanding investor relations activities, as determined by a survey on companies' IR activities and user satisfaction. 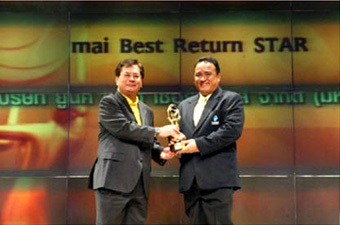 The Award of “Mai Best Return STAR” from SET AWARD 2005.
on the Stock Exchange of Thailand (SET) MAI, as a consequence of being a company that can generate good return on equity, in 2004, by considering the operation of the company on the aspect of performing the functions in accordance with the requirements established for disclosure of SET data MAI and liquidity of securities. 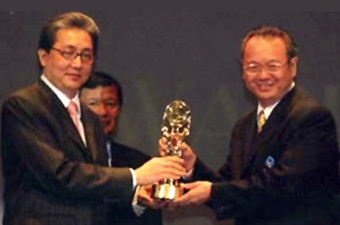 Award of “MAI Newly Listed STAR” from SET AWARD 2005.
the Stock Exchange of Thailand (SET) MAI, in 2004, by considering the success in proposing the sale of securities to the public, including financial status and company performance.